← Why are there more New Yorkers in North Carolina than Texas? In 1880, 14% of U.S. workers were employed in manufacturing; in North Carolina, 4% were (most were working on farms). Employment in manufacturing grew steadily in both the nation and the state through mid-twentieth century. 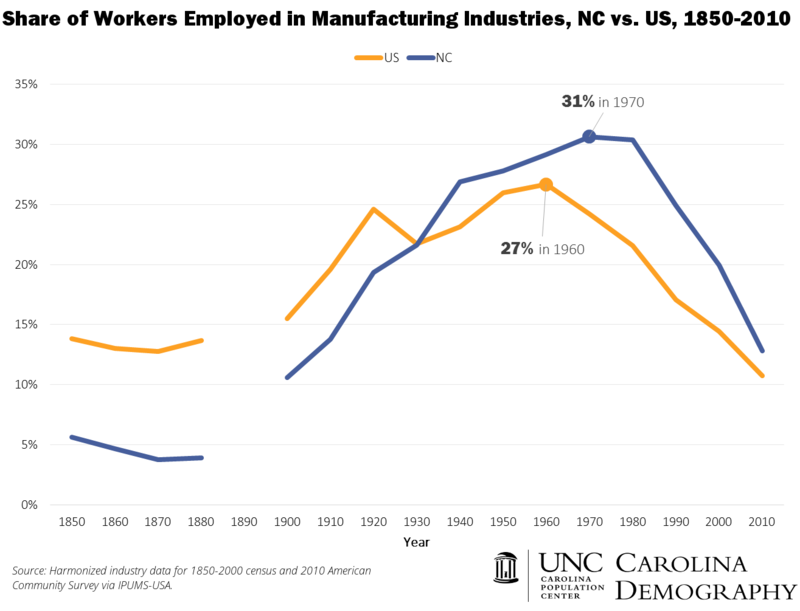 By 1930, 22% of North Carolina workers were employed in manufacturing, matching the national rate. National employment in manufacturing peaked in 1960 (27%) and subsequently declined. Since 1940, North Carolina’s share of employees in the manufacturing industry has been higher than the national average. The state share in manufacturing peaked in 1970 at 31% and stayed steady through 1980 (30%) before declining rapidly. In 2010, 11% of all U.S. workers and 13% of North Carolina workers were employed in manufacturing. This entry was posted in Carolina Economic Data and tagged employment, industry, manufacturing. Bookmark the permalink.